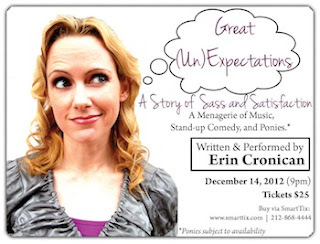 the erin cronicals: Update: Debuts Galore! This quarter has seen some amazing things for my career, both on and off stage. I have been brought on by Backstage Magazine to be one of their "Advice Experts." My first article, "10 Sacrifices an Actor Makes" was so popular it became a front page headline article in the November 21 issue. (click here for article.) You can see all of my articles here. "Regulars at the long-running Salon open mic know Erin as one of the most wonderfully strong and reliable deliverer of musical theatre material. I heartily recommend her show where she fulfills the promise she consistently showed at those open mic nights. (She also shone brightly in another Napolitano-directed revue, Smile on My Face: The Songs of Richard Eisenberg, also an entry in the Urban Stages series.) Erin is a breath of fresh air: a clean and powerful sound, an intelligence presence in interpreting songs of more recent vintage, finding interesting acting moments in the lyrics and not shying away from emotional depths. Her autobiographical patter is frank, unpretentious, and revealing – as she shares her professional and personal goals and how she achieved them. She's a consistently focused and caring singer..."
At the same festival 3 singers and I also reintroduced audiences to “Smile On My Face: The Songs of Richie Eisenberg”- it's a wonderful show that will have one more performance on February 7, 2013 - you have one more chance to see it! J Scott Mitchell, Reviews Off Broadway- "Enter Molly, played by Erin Cronican, a burglar with an attitude...Ms. Cronican’s character Molly benefits from lovely writing, and she gives a nicely restrained performance. A burglar that stirs emotion in wounded psyche, and then responds to it, is a tough act to render believably." 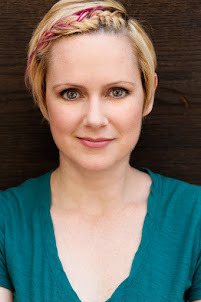 Jennifer Szulman, ReviewFix - "Molly, played by Erin Cronican also Director of the show, soon becomes the light that brightens up Beane’s dark days. When she is around, nothing bad can happen. Cronican and Walker, still riding high from their summer success in “The Lover” and “Danny and the Deep Blue Sea” are a joy to watch. The relationship between Beane and Molly starts to parallel Joan and Harry’s. When things go well for them, Joan and Harry see progression in their communication as well." My musical theater collective, ACTOR-OWN, is still going strong. For the past 2 years we've done private readings of the musicals like, THE MOST HAPPY FELLA (Rosabella), CABARET (Sally Bowles), THE LIGHT IN THE PIAZZA (Clara) and LEGALLY BLONDE (Elle Woods.) 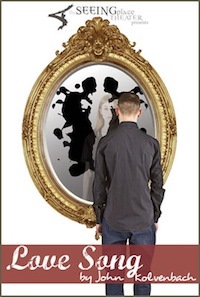 ACTOR-OWN certainly allows me to stretch my skills and develop strong connections to characters I'm destined to play. Visit my Demos page to hear vocal clips, along with some other live tracks. I also have more clips from film, TV and cabaret. As always, you can check out this acting blog for stories and adventures about my time as an actor here in New York City. You can also check out my coaching blog: Bite-Size Business for Actors, which has a bunch of tips & hints about how to go about building an acting career. Finally, you can check out the other blogs where I'm a contributing writer: The Seeing Place: Our Craft, Our Process (which is about the art of acting) and Backstage, which is more business-driven.